25 years ago on April 27, 1989 soldiers try to strop students entering Tiananmen Sq. 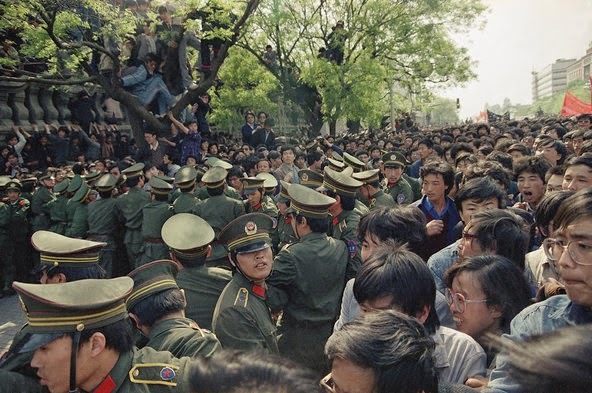 On April 26, 1989 the People's Daily ran an editorial with the objective of frightening students into submission that had the opposite effect enraging them instead and mobilizing many more to go and protest in Tiananmen Square. It was a strategic blunder of the first order carried out by the highest levels of the Chinese Communist regime. Imagine for a moment that for 51 days of demonstrations beginning on April 15, 1989 thousands of students gathered nonviolently to protest and demand reforms. Protests had taken place before in China in 1986, but had not been sustained. This time, in part due to the regime's demonizing of the student demonstrators, the protests grew and did not dissolve. I’d gone to Beijing after the Tiananmen Square protests were well underway. That whole event, which it should be remembered, was not just in Beijing, but reportedly in 350 other cities of China, similar protests were going on, but they were not planned. They were not prepared. There was no strategic decision. There was no advanced decision how long you stay in the square and when you leave. What became very clear to me in retrospect was that the students in the square were operating with great commitment and bravery, but they really didn’t know what the hell they were doing. The students had no plan. They were improvising all the way through, and later on we know that many of those Chinese people who were out on the streets, in another day, were shot and killed. The attitude that you simply improvise and improvisation will bring you greater success is nonsense. Exactly the opposite – that if you don’t know what you’re doing, you’re likely to get into big trouble. This struggle is not about particular pieces of real estate but the institutions that may be associated with them—iconically, of course, Wall Street. And it would be a bad strategy—it’s always bad strategy—to hold on to symbols, especially when they make you an easy, concentrated target. Nonviolence is a compelling force that works in the social field to draw people together, often by courageously resisting injustice on one hand, but refusing to inflict suffering, on the other hand. This force, accessible to each one of us by virtue of our human being is engaged whenever we resist but do not repress a separating drive like fear or anger. Nonviolent action works by getting a population to withdraw its support and obedience from the opponents. By getting key groups to withdraw their consent, nonviolent action is able to remove the sources of power for a regime or opponent group. At the height of the student movement in China, over one million people marched in the streets of Beijing. This movement ended with the government's crackdown and the Beijing massacre of June 4. Below is the documentary, The Gate of Heavenly Peace, that captures the days of protest leading up to the crackdown and the massacre. Nonviolent resisters should learn as much as they can about this important movement both its successes and failures. Finally, the struggle for a free China continues to the present day and needs our solidarity.